Cost to raise a heifer ranged from $1,595 to $2,935 on these 49 Wisconsin dairies. Here is what led to the $1,340 difference among operations. The authors are respectively: UW-Extension Taylor County agriculture educator, Sheboygan County dairy and livestock agent, dairy herd management specialist, and a James Crowley dairy management intern. The first two articles in our UW-Extension "Real Heifers…Real Herds" series highlighted the data collected by 21 county-based extension agents on 49 Wisconsin operations. As part of the field survey, our group looked at the specific effect of operation type on calf and heifer raising costs. We looked at those utilizing: a tie stall barn as the milking center (tie stall), a parlor as the milking center (free stall), and custom calf/heifer growers (custom grower). These three groups were further divided into calf and heifer enterprises. One of the major reasons for investigating raising costs of dairy replacements was to demonstrate variability among different systems. 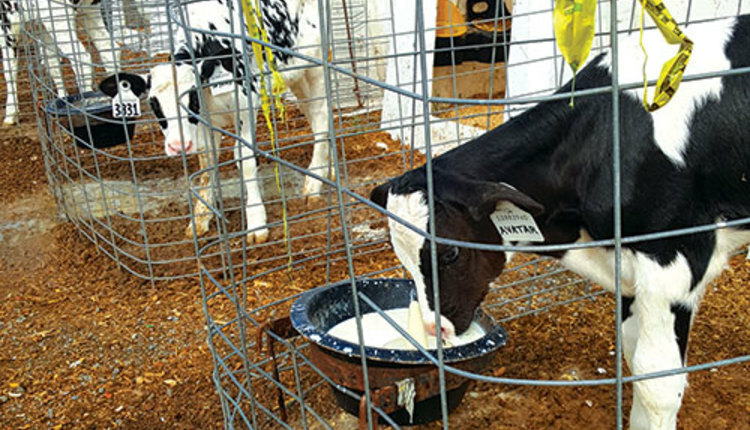 The cost to raise a dairy replacement from birth to freshening ranged from $1,595 to $2,935, averaging $2,149 per heifer. This is a 58 percent jump from 1998. Over $5 per day . . .
Across 40 operations raising calves, the average cost to raise a calf from birth to 61 days old was $326 or $5.31 per day. Tie stall operations spent $5.78 per calf per day, while free stall operations spent slightly less at $5.59. Custom calf growers were 44 percent more cost efficient than the other operations ($3.16 per calf per day). Figure 1 illustrates the daily calf raising costs by operation. Please note these costs did not include the initial $500 value assigned to each calf. Feed cost included liquid feed, starter, and forage. Variable cost (excluding feed) included bedding, veterinary, death loss, and interest. 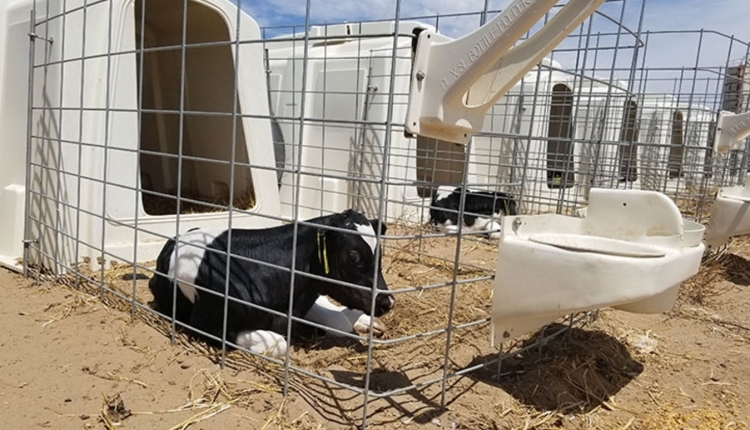 Fixed cost included calf housing and equipment. Labor and management, including paid and unpaid, were established at $12 and $20 per hour, respectively. Labor and management (both paid and unpaid) was the highest cost center for raising calves, making up 47 percent. That is an average $2.49 per calf per day. Among the three operation styles, labor and management was the largest cost in tie and free stall operations at $2.93 and $2.51 per calf per day. Labor and management was the second largest expense for the custom calf grower at $0.95 per calf per day. That cost was 65 percent lower than the other two operations. 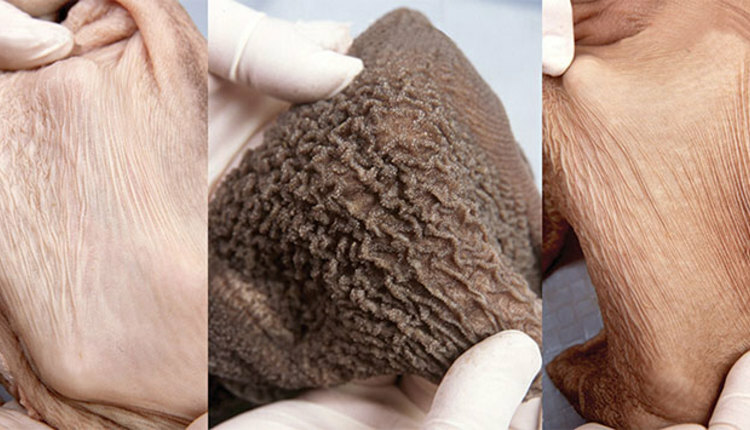 Clearly, labor and management costs had a significant impact on calf raising costs. Our next article will examine labor and management across operations. The second highest cost center across all operations for raising calves was feed cost, making up 34 percent. Calf feed costs averaged $1.83 per day for all operations. Of the 40 farms surveyed, 36 utilized milk replacer as the liquid feed. The remaining four farms utilized pasteurized waste milk at $3 per hundredweight. Even though feed, not labor and management, was the highest cost center for the custom calf grower, they still had the lowest total feed cost for a calf at $78.31 or $1.39 per day (56.9 days on feed) as compared to tie stall and free stall operations at $111.66 and $197.01, or $1.79 (66.5 days) and $2.05 (58.6 days) per calf per day. Custom calf growers spent $0.88 and $0.50 per calf per day for liquid feed and calf starter, respectively. Custom calf growers did not utilize forages in their calf feeding program. Custom growers have lower feed costs since they were able to wean the calf at 6.4 weeks of age and had the calf on feed for fewer days (56.9 days). 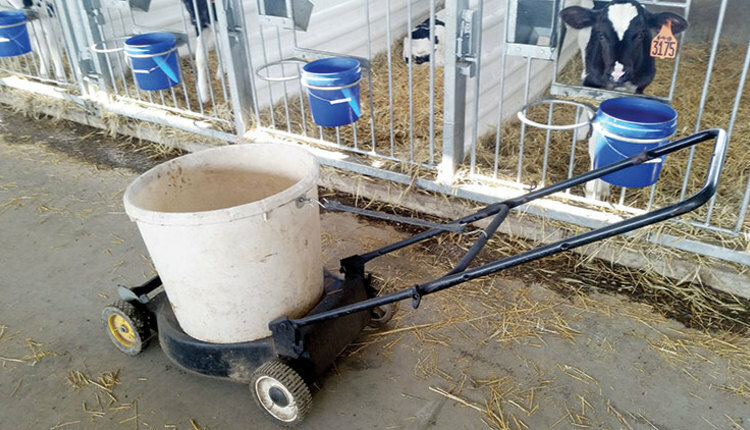 Because custom calf growers weaned calves earlier, some liquid feed savings were offset by additional calf starter costs. Other feed cost savings may have included purchasing milk replacer in volume and utilizing pasteurized waste milk. Tie stall operations on average spent $1.44 per calf per day for liquid feed and $0.33 per calf per day for calf starter. Free stall operations spent $1.63 per calf per day for liquid feed and $0.40 per calf per day for calf starter. There was no difference in cost for forages between the dairy operations. Average weaning age for all operations we surveyed was 7 weeks of age; tie stalls had the oldest weaning age at 7.5 weeks. Free stall and custom calf growers had similar weaning ages of approximately 6.8 and 6.4 weeks, respectively. 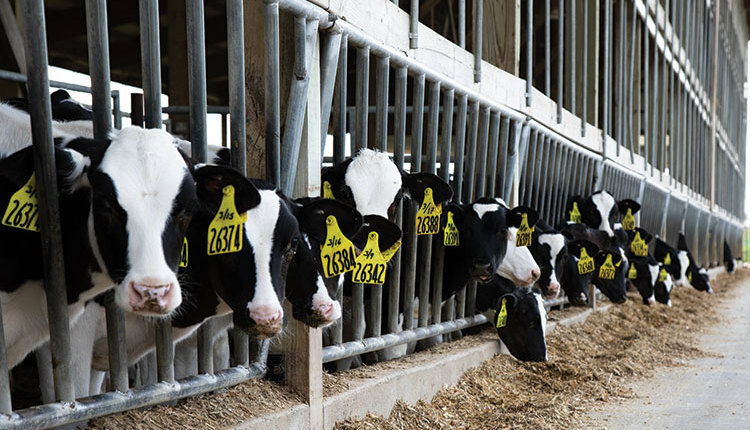 Lowering the days on feed has a direct impact on feed costs. Tie stall operations fed liquid feed longer which resulted in a slightly lower calf starter cost. 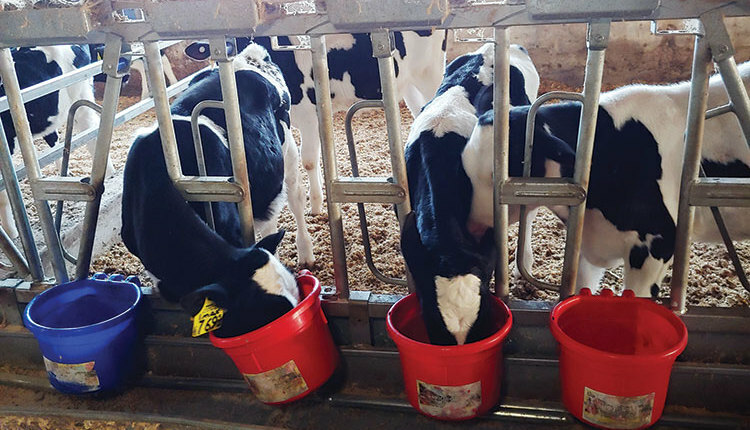 Even though tie stall operations fed liquid feed longer than the free stall operations, their total feed cost per calf per day was less. Daily variable calf costs were essentially the same for tie stall and free stall operations ($0.89 and $0.85 per calf per day, respectively). The custom calf growers' variable cost was less than half that of the tie stall and free stall operations, averaging $0.41 per head per day. Within variable cost, veterinary expense differed most between dairies and custom growers. A tie stall operation spent almost three times more ($0.35 per calf per day) on veterinary related expenses than custom calf growers ($0.13 per calf per day). Free stall operations spent about 2.5 times more ($0.32 per calf per day) than the custom calf grower. In our survey, we counted colostrum replacement products as a veterinary cost. Both dairy operations used this product which was an expensive item custom calf growers did not purchase. Despite differences in veterinary costs, we did not observe large difference in death loss. The average death loss reported for tie stall, free stall, and custom calf growers was 2.8 percent, 2.9 percent, and 1.8 percent, respectively. These percentages represented the death loss of live calves and did not represent any calf losses during the first 24 hours of life. Custom calf growers spent $0.37 per calf per day on housing, while tie stall and free stall operations spent $0.16 and $0.13. Less range once weaned . . . In our survey, the average cost to raise a dairy heifer across 44 operations was $1,323 or $2.04 per day. Differences in heifer-raising costs between operation types (Figure 2) were not as large as the calf-raising costs. Tie stall operations incurred a daily cost to raise a heifer of $2.12, free stall operations of $2.04, and custom heifer growers an average of $1.93. Feed cost was the greatest expense to raise dairy heifers, regardless of type of operation, making up over half the total cost. The average feed cost for all operations was $1.05 per heifer per day (648 days). Comparing the three operations, custom heifer growers had $0.15 to $0.18 lower feed costs per day than the other operations at $0.92 per heifer per day. Please note, custom heifer growers fed the heifers approximately 92 days less than the other operations. This was due to the fact custom heifer grower returned the heifer to the dairy owner prior to freshening. Tie stall operations fed a heifer for $1.07 per day and free stall operations $1.10 per day. In our survey, custom heifer growers grew heifers faster, freshening them at an average of 23 months of age. Both dairy operations freshened heifers at an average age of 24 months. In regard to heifer-raising costs, the other three areas were essentially the same.